Situated in the heart of downtown on the high floor over-looking the lake-view we are just opposite the Metro Convention Center, about a few minutes walk from the Union Station, Canada's busiest transit hub, the Exhibition Place ,major hospitals such as Mount Sanai Hospital or the Princess Margaret Cancer hospital. Whether you are visiting Toronto as a tourist or on business, all the attractions such as the CN tower or the Ripley's aquarium and the convention centers or the financial district are all in walking distances. We have in the neighborhood great restaurants and sports bar to experience the great food of Toronto. The harbor front is a few minutes walk where you can enjoy a great walk on the shores of Lake Ontario. The condo is a one bedroom with the most comfortable queen bed with hotel quality pillows and linen. Television has 100+ channels includes all major networks like CNN BCC Sportsnet and WiFi with a high speed internet connection. 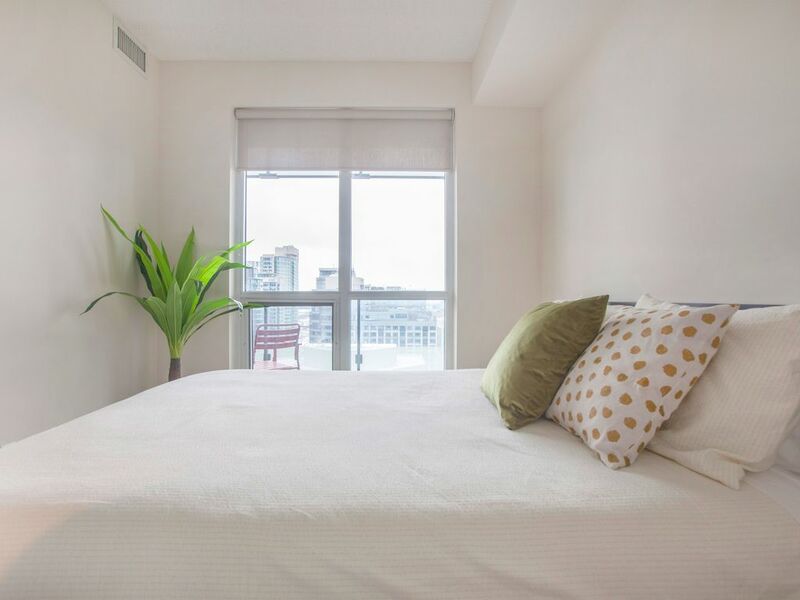 Perfect for a getaway or for business, this modern condominium apartment has everything you need for your stay in Canada's largest city. This is truly an amazing condo for your downtown stay, a wonderful hotel alternative. I am an entrepreneur currently involved in retail sales business. I am a pilot (hobby) and love flying the Cessna single engine planes. I love to travel and my wife and myself have traveled to all continents except Australia which is on our wish list. I enjoy and look forward to meeting people from around the world that is why I love to host. Toronto downtown is a vibrant location - it is a fun place with all the convenience of commuting, dining and entertainment. I own multiple properties in downtown and this property is located in an upscale condominium. Either you are visiting Toronto on business or sight seeing, this location is so convenient in terms of commuting. You can get the underground or a train / bus to the suburbs from the Union station which is a few steps away. The Metro Convention Center is just across our place. The landmark of Toronto which is the CN Tower or the Ripley's aquarium are all steps away. For guests on a medical trip here in Toronto, all major hospitals are in the vicinity You want to go for fine dining or a casual supper, they are all in walking distances. Great location and a very great apartment I would give this a 5 star overall the only reason I am not is due to the alarm testing ever single day! It went off every day I was there at 9-930 am. Other than that a great place to be I would highly recommend it!!! Harold B.Nahant MA - USA ( just 12 miles north of downtown Boston. I picked this condo due to its location near the SCOTIABANK THEATRE as we were attending Toronto Film Fest. The location was only 4 blocks away, a nice walk. The condo itself is perfect, a one bedroom with a comfortable bed and a living space with kitchen / TV area. I would like to see some of these HOME AWAY condos have a little more extensive cable service, but understand it is a business for home owners. I am also of the opinion that these homeowners should have a better supply on hand of soaps/ shampoos / conditioners etc as most only feature one. We have stayed at a few where they have a closet full of items and this is nothing more than being better than the rest. This is not to diminish this condo. All in all we we were very pleased with the location, the building, the condo and so on. The condo is an Very very good...we stayed one week. The space was located conveniently to explore multiple parts of the city. Accommodations were exactly as pictured and just enough to suit our needs. The location is right in the middle of it all! The unit has everything you need and is quiet. The Gym is pretty good and has a lot of room. The pool was closed but looked good. I would stay here again. We had a very good time. Very comfortable and close to everything! Very personable and friendly owner, close to everything. We had a very good visit!